As the prospect of $5 dollar gas looms large some San Diegans are becoming reacquainted with an old friend from childhood: their bicycle. Across the country one-fifth of all Americans say the recession has changed the way they commute. Since 2001, the number of trips made by bicyclists in the U.S. each day has increased to 4 billion and for good reason. In recent months the news at the pump has not been good. The National University System Institute for Policy Research calculated that if gas remained at $4.37 per gallon, the average commuter will have spent close to $500 extra dollars by year's end. Here, gas prices have risen from $3.50 last December to $4.37 in March - a boost of 87 cents per gallon. 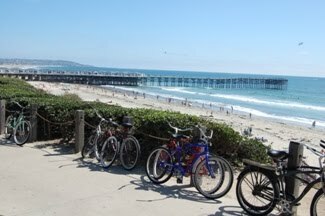 On the other hand, the San Diego County Bicycle Coalition reports that on a ten-mile round trip, bicyclists can save $10 a day. Not to mention the health benefits: three hours of bicycling per week is said to reduce the risk of heart disease and stroke by 50 percent. I started commuting with a combination of train and folding bike when gas prices hit over $4 in 2008. Since then, I think I must have saved so much on gas, since instead of driving to and from work every day, I pretty much only use my car on the weekend.